Australia chop their way to the top! What a weekend! 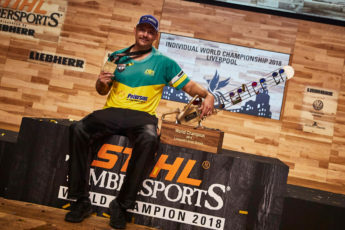 The most exciting of extreme sports events rocked the city of Liverpool on Friday 19thand Saturday 20thOctober when the STIHL TIMBERSPORTS®World Championship came to town! 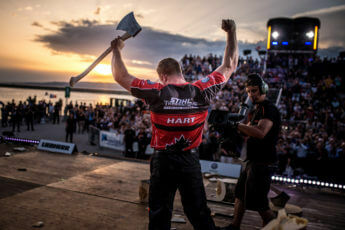 The TIMBERSPORTS® Team World Championship was the first of the weekend’s big action on Friday and the British Team were relishing the chance to compete in front of a home crowd at the Echo Arena Liverpool. “People were shouting and screaming and jumping out of their seats – it was almost overwhelming how good the support was, the best I have ever experienced”, said Elgan Pugh, Team GB member and four-time British champion. And the atmosphere was certainly electric with fans from all over the world spread throughout the vocal audience. 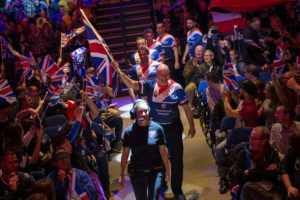 The support for Team GB was particularly noisy, with plenty of flags, banners and T-shirts on show when the teams were introduced on to the stage! The main action got underway with the Second Chance round – earlier in the day, all 21 countries took part in a time trial to determine their ranking for the competition. The top 12 teams automatically qualified for the round of 16, whilst the bottom 9 teams in the time trial had one last chance to qualify via the Second Chance round. Despite recording a solid time of 1:14.49 minutes for the four World Championship disciplines (Stock Saw, followed by Underhand Chop, Single Buck and Standing Block Chop), Team GB were disappointed to get a 15-second time penalty for a rule infringement in the Stock Saw leg of the relay. Their original time would have put them into 10thplace and seen them comfortably qualify for the round of 16, but the penalty pushed them down to 19thin the overall ranking. They had a chance to redeem themselves in the Second Chance round, when the team had to deliver one of the best four times in the round to get through to the next stage, and the excitable crowd helped Team GB deliver a solid time of 1:17.79 minutes. Their excitement was short-lived though when they were drawn against the formidable Australian team in the round of 16. With the Chopperoos in exceptional form, they smashed through their four logs in under a minute and convincingly knocked out the Brits, who had to settle for 13thplace overall in the competition. 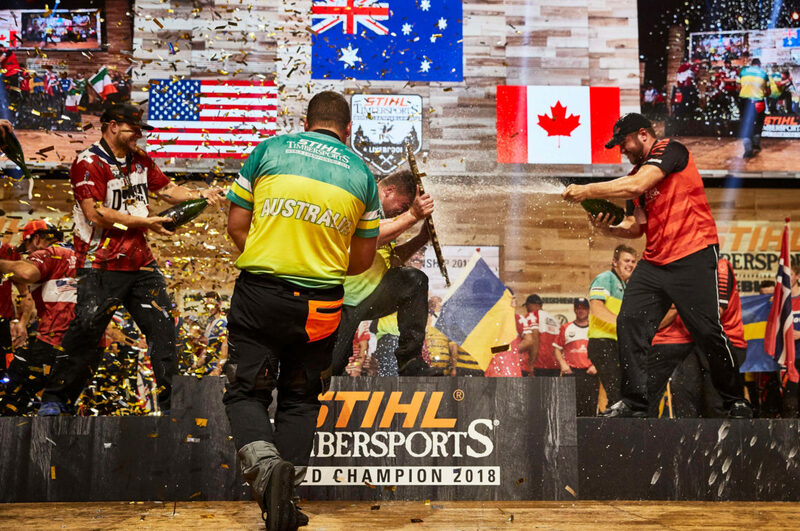 Australia’s TIMBERSPORTS® World Championship team’s impressive results continued throughout the competition, with Brad De Losa, Jamie Argent, Brayden Meyer and Glen Gillam defeating the Czech Republic in the quarter-final. And they showed no signs of feeling the pressure when they set a new World Record in their semi-final against Canada, completing the relay in an unbelievable 45.10 seconds! This dedication to their TIMBERSPORTS®team was apparent for all of Team Australia and when they came up against the USA in the final, they were just too strong for the Americans, beating them by 7.94 seconds to reclaim their World Championship title once again, in front of an ecstatic audience. Team USA were still happy with their silver medal, improving on their 2017 finish, when they came in fifth. 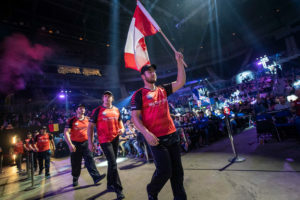 Canada also managed to go one better than 2017, moving up from fourth to third, after beating last year’s champions, New Zealand, in the battle for bronze. The Individual World Championship took place the following night and you can read the epic story of how the night went down here. 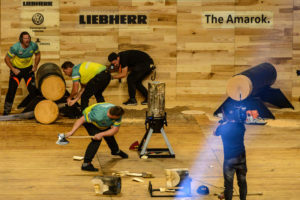 You can read the full results and times for the World Championship on the official TIMBERSPORTS®database or watch the full video of the event on the TIMBERSPORTS®YouTube channel. Did you watch the World Championship? Who did you think would win? Tell us your highlights of the event in the comments below. Very interesting competition!!! When and where the following world championships will be held? Hi, the venue for the 2019 World Championship hasn’t been confirmed yet, but keep an eye on the blog and the STIHL TIMBERSPORTS® Facebook page for all the details when they are available. 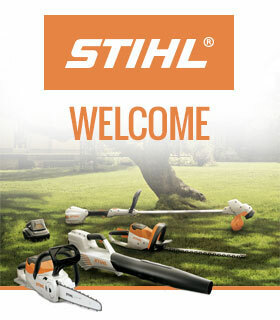 Which chainsaw Personal Protective Equipment works for you?